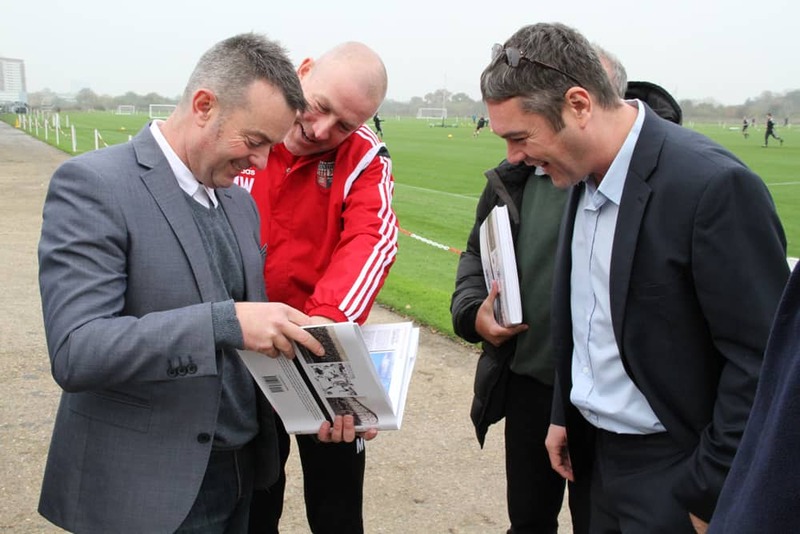 Brentford manager, Mark Warburton, was the first person at Brentford Football Club to hold and enjoy a ‘hot off the press’ copy of the club’s new official 125 Anniversary book. The Bees celebrated the landmark birthday during October, and are holding a special gala birthday dinner at the Hurlingham Club this Thursday evening, so the arrival of these gold-foiled books is the icing on the cake – it should certainly be on all fans’ Christmas present lists this year! The book will be available to buy online priced £29.99 through the club’s website from 4pm Thursday 20th November, and from the Breamar Road Club Shop from 10am on Friday 21st November, ahead of the local derby with Fulham at Griffin Park. “Brentford 125: The Official History” will offer a sentimental, and often emotional, excavation of club landmarks throughout the years. The story starts from the events surrounding the formation of the club by its founding fathers right through to the euphoria that surrounded May’s 2014 promotion to the Championship. The book, which is produced by those behind the impressive Big Brentford Book series, has been designed to celebrate events and re-live matches which have been etched in the record books, and to remember the players and some of the personalities who have rightly earned their place in the memory banks. The journey through the decades has been achieved by replicating actual press cuttings from a variety of sources, many by local newspaper reporters George Sands and Ernest Gifford – in addition to the pseudonym ‘Argus’ – a moniker that was handed down to successive journalists at the Richmond and Twickenham Times from the early 1900s right through to World War Two. Lots of popular personal favourites will be found, alongside the unusual and quirky items – the book provides an opportunity to reminisce, savour and discover the magic of 125 glorious years of the Bees.